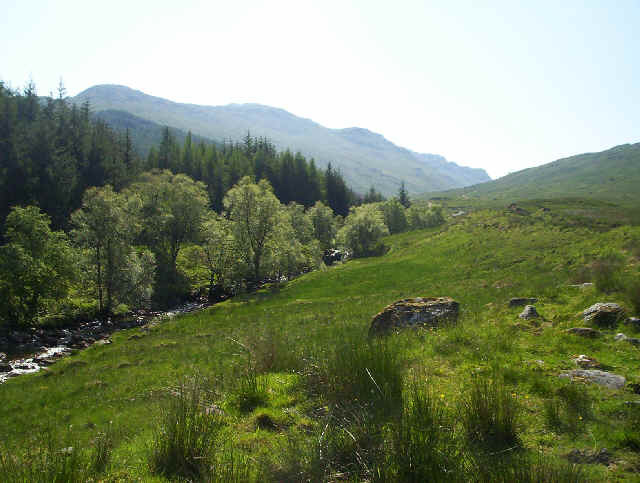 This day's walk in May 2007 started at Crianlarich station with a brisk walk along the wide verges of the A82, to the parking area about a mile and half south of Crianlarich where the River Falloch performs a ninety degree bend. Here I'm walking up the broad track by the River Falloch with the slopes of Cruach Ardrain on the left. I've crossed over the bridge (it's not shown on my Harvey's map but it's definitely there). There's a vague path that runs up by the side of the deer fence along the edge of the plantation on Hawk Crag. 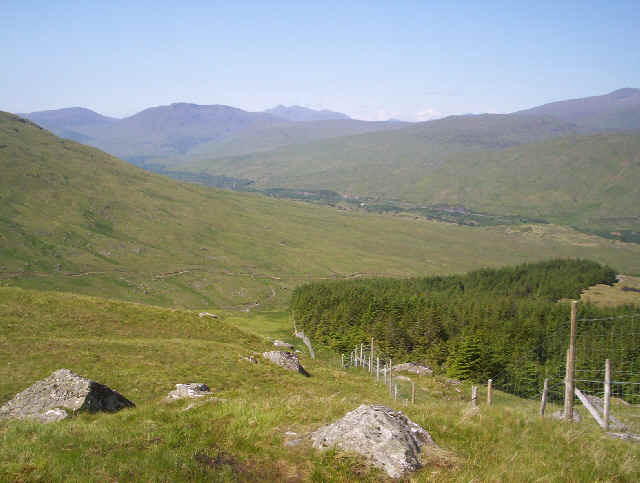 in the background is Glen Falloch towards Ardlui. 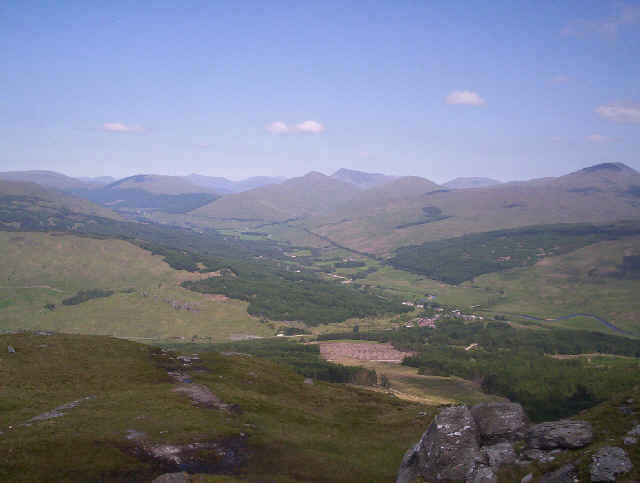 Looking down over Crianlarich and Strath Fillan. 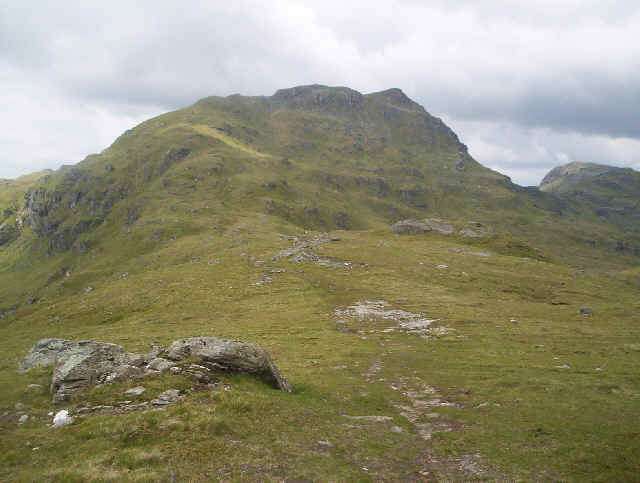 Cruach Ardrain from the summit of Meall Dhamh. 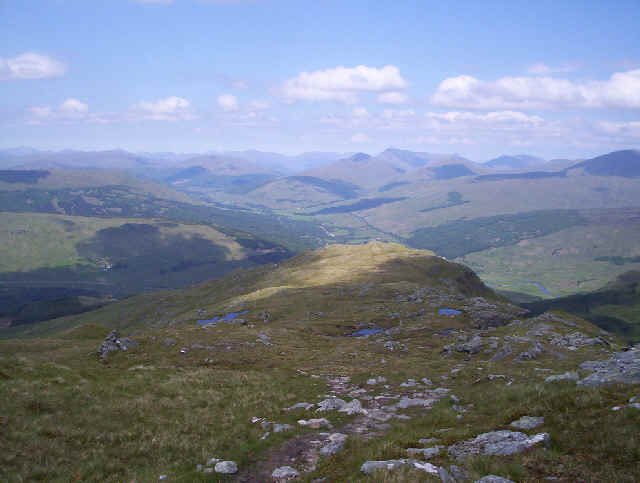 My wife and I had got as far as this in October 1999 on our first visit to Crianlarich. It was here that we realised that we couldn't go any further because of snow and ice. 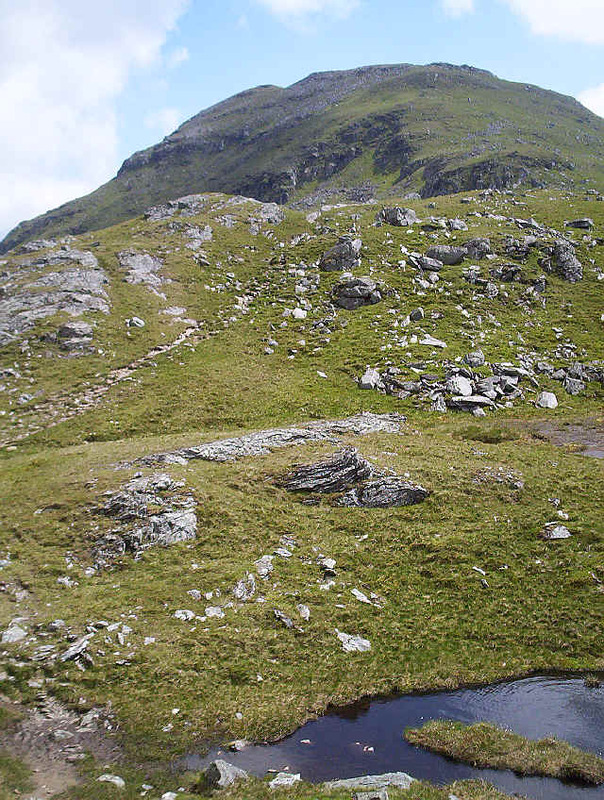 the path drops down from Meall Dhamh to a bealach before traversing to the right of the hill to a point near the notched rocks on the right. 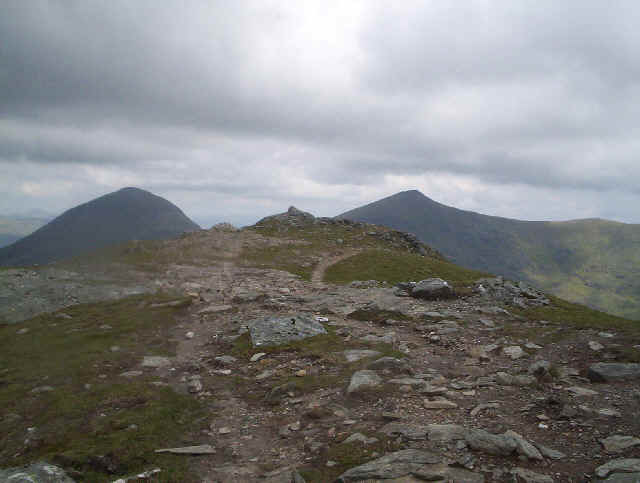 It then turns and approaches the summit round the back. 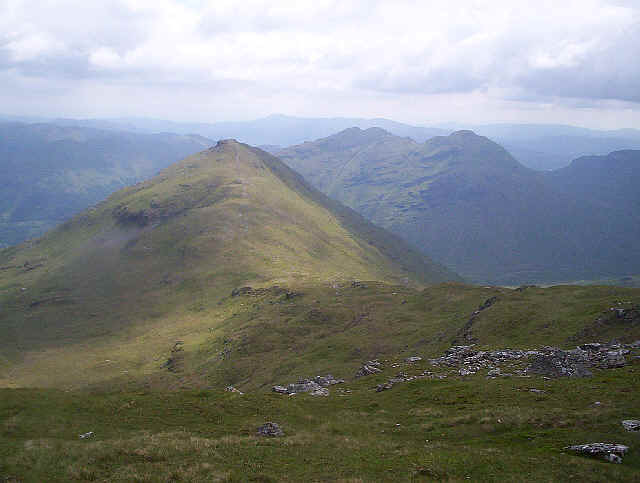 A panoramic view of Beinn a' Chroin and An Caisteal. 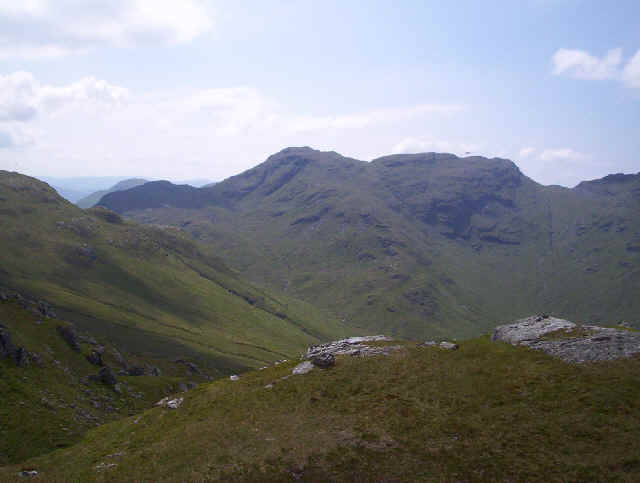 After leaving Cruach Ardrain the path drops down to the bealach between Cruach Ardrain and Beinn Tulaichean. 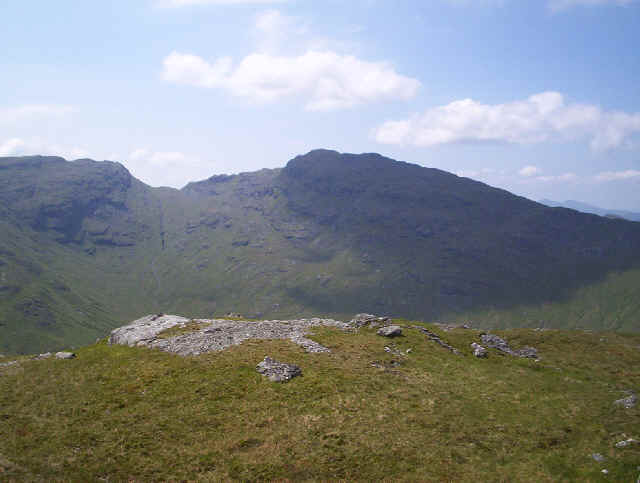 Here we see Beinn Tulaichean with an enjoyable gentle ridge walk in prospect. 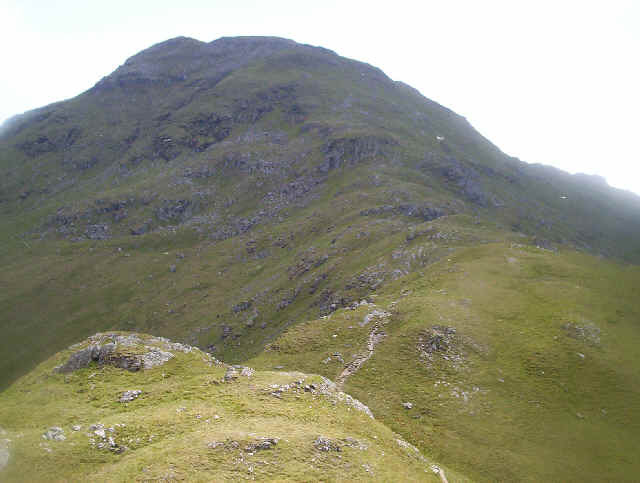 The somewhat uninispiring summit of Beinn Tulaichean. 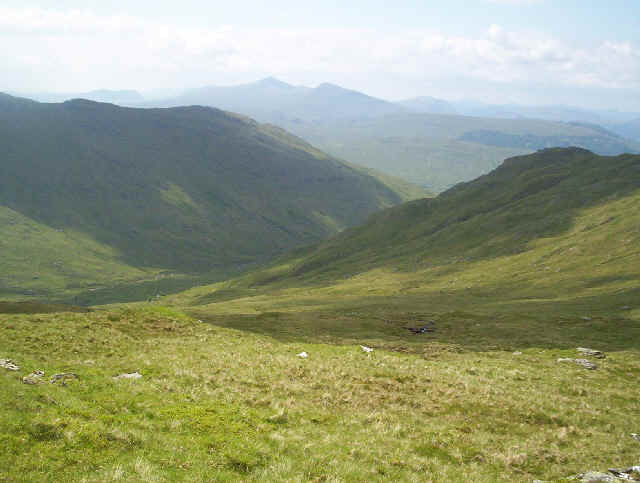 I'm now returning to the bealach between the two hills. 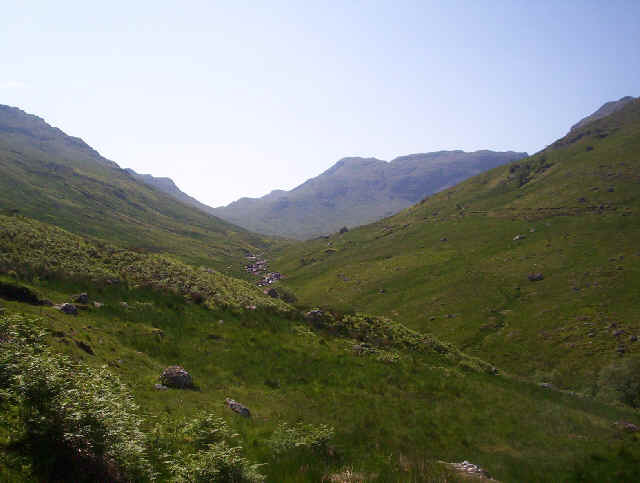 I've decided that I'm going to drop down into Glen Falloch by leaving the path at the bealach and heading for an obvious notch between Stob Glas and Cruach Ardrain. I've left the main path and I'm dropping down into Coire Earb. 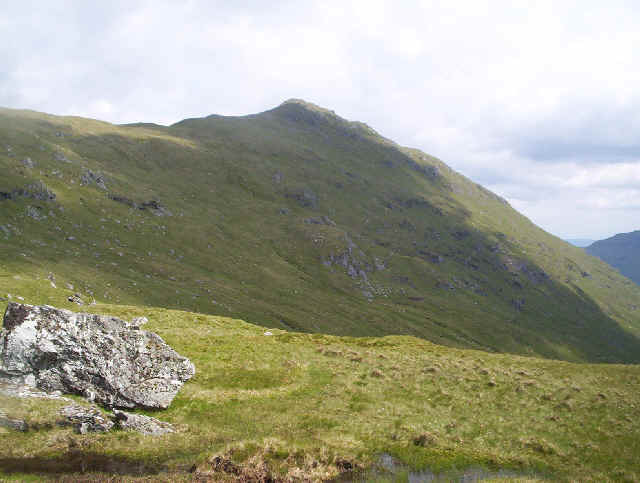 Beinn Tulaichean rises above. The trackless route over notch between Stob Glas and Cruach Ardrain proves easy and before long I'm heading down the slopes to the river Falloch. Once down by the river it was relatively easy to cross and then follow the stalking track down by the river. This was most definitely a low point of the day as the path was very boggy and, together numerous deer hoof prints, made progress extremely slow. All that remained then was the walk back to Crianlarich.